In August, I wrote about feeling surprisingly apathetic towards the Union this year. I didn’t like feeling that way about the Union then, and don’t like it now. 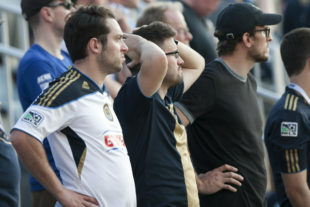 I recently went through the most harrowing, and heavily over-analyzed season ticket renewal processes ahead of my soon-to-be 9th season in the stands at PPL Park Talen Energy Stadium. Where is this thing headed? And how much money do I want to spend (or not spend) to go along for the ride? Hope is one of the key elements that make sports great. It’s why opening day is so magical – just about everyone has a chance. Everything is out in front of you, and the possibilities are endless, save for the Cleveland Browns. Maybe this is the year your team makes the leap. Hope that you’ll witness something beautiful, or even a transcendent moment that you’ll always remember. There have been moments with this team and organization, and it’s something I’ve always enjoyed sharing with family, but eight years stuck on a treadmill to “eight place or so, and maybe if everything breaks right, we can eek into the playoffs” eventually takes its toll. Bad to good? – In MLS, there’s no great incentive to be bad. With few exceptions (Blake, Birnbaum, Harrison, Larin) in recent years, most MLS draft picks don’t make a huge impact. One could argue the Union have drafted fairly well in recent years, identifying and securing talented players like Elliott, Marquez, Rosenberry, and Herbers, but even if all four are back on track and contributing in 2018, much more is needed to elevate this team into contention. Unlike the NBA or NFL, the reward for finishing near the bottom just isn’t very meaningful. Without a quick fix to be had in the draft, you might as well retool and aim high each season. Parity level – In MLS, anyone with a well-constructed roster has a shot at being competitive each year. Take a quick look at the Western Conference playoffs this year: Dallas and LA went from #1 and #3 seeds last year to missing the playoffs this year, and San Jose and Houston went from 9th and 10th place last year to being in the playoffs this year. Player movement – In MLS, and the world of soccer overall, with two major transfer windows and a massive pool of international players spread across a wide range of competitive leagues, tweaking or even overhauling a roster is fairly easy. Doing it well of course, is a challenge, particularly on a tight budget. However, well managed teams have proven they can build and shape consistently competitive rosters without spending obscene amounts of money (see: Columbus, SKC, NYRB, Dallas). The flipside is that best laid roster plans can also be disrupted on relatively short notice, as seen by the fairly sudden departures of Vincent Nogueira and Tranquilo Barnetta in 2016. Given the ease and frequency of player turnover, it’s hard to justify too much long term planning at the expense of winning games now. Youth focus – The Union’s approach to building from the base up, via the academy, makes a ton of sense in theory. Academy players can be molded and trained to play a certain style or system. It’s a cost effective way to source first-team players, versus the international open market or even MLS player moves. However, it takes a while to develop, and the Union haven’t shown a real willingness to play (and be patient with) the young guys. So it’s still a bit of a question mark. The Union’s plan really does require a lot of things to go right in order for it to pay off. The academy pipeline needs to deliver top talent, they need to be trusted and given opportunity when they do arrive at the first team level, and the right complementary mix of veterans needs to be in place to support them. And at what point does Union management feel there’s enough of an established core in place to make a splash and add those difference makers? I’m left with a feeling that building through youth is an admirable longer term plan, but that it can and should co-exist with fielding a competitive team year in and year out. Given the unpredictability of young players entering the league, relatively parity in MLS, and high turnover of rosters (Medunjanin is wanted in Germany’s 2nd division? Please no), the best intentions for building through the academy still feel like a great unknown. There are enough mechanisms in place to meaningfully reshape a MLS roster each year and field a team capable to competing for a MLS cup while we wait for the academy investment to mature. I believe this fan base is largely on board with an academy-first approach, but not okay with writing off another season in 2018 waiting for that to come to fruition. My belief is that management is acutely aware of fans’ collective psyche, whether through coverage and comments on this site, social media, or via season ticket interest this off-season. Eight years in with no playoff wins has taken its toll. My brain gets the plan, but man does my heart need something to be excited about for the 2018 season. You know, if Curtin had given a lot more minutes to Jones, Najem, Epps, Wijnaldum, et. al. and ended up with the same or even a slightly worse record, I don’t think the fanbase would be nearly as salty as it is right now. And before someone replies with “that’s what Steel is for,” I say any players who are 22, 23 or older should be fighting for space on the first team right now. And they should be given regular starting time. I know it’s early in the Stewart regime, but we’ve seen more young talent fade than blossom. Look at last season’s remarkable draft trio of Rosenberry, Yaro and Herbers….. It’s aggravating. Anyone coming from our youth ranks should be 20yrs max. – and they should be on the first team at that point. If we can’t achieve that then we aren’t running our academy correctly. Jim was an idiot for not playing our younger guys for the last 4 games (min.). There was no reason for us to be playing a bunch of guys who we knew who they were or that weren’t going to be around in 2018. Between this specific club’s mediocrity and the overall despicable behavior of the league towards Columbus, I think it’s time to stop giving either any support. Why should I watch subpar soccer, for too much, in a league that is willfully abusing the goodwill of the soccer community in the US? Remember the crest rebranding, sure these things are usually full of bs but don’t put it in there if you expressedly don’t mean it. The Union aren’t trying very hard to be interesting, nor are they doing much for the community. I mean bringing in Widener kids to run concessions for charity was one of the most community-abusive things I’ve heard, although I’m having a hard time finding a concrete reference to that. Plus the total failure of the plans that were supposed to revitalize the area or even the hostility towards the locals regarding the parking situation. Oh and btw is Lot A paved yet? Of course not. Actually the revitalization of the area around the stadium is not the Unions fault.A lot of investors and people who were going to kick start that backed out. The Philadelphia Union had the oldest average player age (28.1) in the league last year. So yeah, I don’t believe they’re building through the academy. Correct! That is one of the reasons why I am not renewing after 8 seasons. There is plenty of other soccer around town that is fun and free: Lone Stars, College Soccer and even the Union Academies. And there should be plenty seats available on Stubhub next year if I feel like tracking down to Chester. More and more teams will spend like Atlanta and if you don’t you will miss out; the parity that may have happened this year may not continue for long. I agree with your last paragraph. I am OK with building through the academy, but not at the expense of a decent product in the short-term. And I am very skeptical that the U really is on a youth movement, management’s actions don’t support their claims. We did not re-doop for next season. I don’t necessary doubt Richie Graham, Tommy Wilson, or even Earnie Stewart. It’s Sugarman. I’m not sure what his investment in the academy is (if anything), but it’s certainly a cheap marketing option. It’s a balm on the fanbase’s wounds and buys Sugarman more time before he can cash out. Agreed. I think there are smart, talented, well intentioned people here. But they seem shackled by a lack of resources (player salaries, scouting, etc). Once again, great article. Unfortunately, it is accurate. The academy (idea) seems great but combining that with the draft, I think both are a waste of time & money. Quit playing for the future and just win NOW. Thank you! Really hoping for more optimistic topics to write about soon. Hi Scott, enjoyed the read. A point I would add is that MLS rosters are very small. 28-31 slots is only 6-9 larger than a full field scrimmage. That’s restrictively lean, as much as is the salary cap. Add to it that there is no way to “in-season trial” your minor leaguers the way baseball can. They could not test Santi Moar or Cory Burke in an MLS game the way the Phillies could JP Crawford. All three of those restrictions hamper any youth development strategy. All the other owners and the Players Union would have to agree to change those restrictions, not just Mr. Sugarman. Well written. Yeah, I’m thinking about supporting DC next year. Maybe I’ll come back in ’19 . . . perhaps Stewart’s plan then will start coming to fruition. I won’t listen to any rhetoric from the Union or whatever. I will go, try to enjoy the stadium and team and hopefully root for a good team next season. If not, I will root from my couch the following year and return when changes have been made that make the team better. That simple. I have said, for every season – in MLS you can be as good as you want to be in. So put up or shut up Union. 1. Yes. I’m pretty sure this will be the case even with Caleb Porter now available. 2. I think probably there will be significant money spent, because of the salaries now off the books/money that will be available to spend. 3. Obviously, we’ll see. They were pretty good at home in 2017. I agree with the three criteria you used to judge the team. We also have reluctantly re-upped for this coming season. We have been season ticket holders since the beginning and it’s been very disappointing to say the least! We too have decided this will be our last year as well if there is not a significant improvement with the first team. Sadly, we can only continue to support mediocrity for so long. Right. I felt like when I became a Founding Member I thought it would be for a minimum of 5 years. Now going on almost double that… if it wasn’t for the good times tailgating with my dad and friends and family… I would’ve stopped. But again, that can only sustain so long. The breaking point has come… and believe me, I love this team… I love soccer… I’m the guy who has a Union tattoo!! But I can only continue to support mediocrity and a half-assed approach to winning for so long. Hopefully this season will not be my last, but we shall see. I am a Founding Member, I originally re-Dooped for 2018 but called my rep. back and cancelled when Jim Curtin was retained for next year. I am just too frustrated with this organization promoting assistant coaches into positions they are not ready for. “The Peter Principle” I love our team and players but I can not continue to watch this mess. This is the second coach and the fourth year that the coach is learning his “trade”. If Jim were learning and developing I might have stayed. PLEASE Mr. Sugarman, sell this team to Joshua Harris, he has the money and already owns a real EPL team: Crystal Palace. Union & Crystal Palace could be a real symbiotic relationship with an owner willing to spend some money. Sugarman is just taking advantage of loyal Philadelphians. It will stop when we stop enabling him. Stop going to games. If you didn’t like soccer and weren’t from Philly wouldn’t you do the exact same thing that he is doing? Specifically, if you sold 90% of your seats, what incentive do you have to spend your own money? Simple as that, but STH keep renewing while saying “this is my last year if things don’t change”. Nothing will change unless the fans do something about it, but people keep perpetuating the same cycle. Throw a really great tailgate party in lot A_ so no one goes into the game. Worse than empty seats shown on TV will be no one buying the $15 beers $10 hotdogs and $5 bottle of water. Will definitely send message…. For the love of god, hire Caleb Porter. I would probably buy season tickets the day of the announcement. At this point I think I’ve just come to acceptance. The Union are going to be cheap, and consistent in what they do. I can’t tell anyone how to spend their money, but if you want things to change, if you want a truly competitive product that coincides with this town’s market share, then people need to stop going to games and spending money on this club. Watch it on T.V. or DVR it. Don’t spend money on concessions. If you must, buy PSP or Sons of Ben gear. It’s going to a better cause and will mean so much more years down the line. Don’t go to town halls. Or If you do, bring signs saying you support X,Y,Z club now. Repeatedly ask questions like: When will the club spend money to compete? When will the owner sell? and so on. Come to this site or go to others to promote how badly and cheaply this club is run. Look, if you are a STH, and especially if you’re an original, you should be getting a better effort from the owner for your time, effort and money. It’s up to you. How much you do want things to change. All4u…selling the first team not enough. Move it AND Jim Curtin to Austin or elsewhere. Then…follow Harrisburg model. Academy to usl team which you move to Chester as stadium is really a Usl stadium. Become feeder of talent to mls and abroad. Then when better plan in place with sponsor who doesn’t use a name that could be an offensive term to females and a plan to share linc or build soccer specific stadium in Philly or a location that isn’t Chester and located close to town and public transportation. Or you wait for union to get their act together. I still find it funny with so many tolerant supporters on here that the Spanish word “Bimbo” for a baking company is met with hostility instead of education. Actually it isn’t a matter of union fans being tolerant…it is embarrassing to explain that time and again to those who do not follow soccer, relatives from different part of country , etc. particularly when a female is involved as term is viewed as offensive by good portion of the US population. My daughter refused to wear the jersey for that reason and chooses to cheer for another team. John I don’t think we should go further into when and why words are offensive in one culture, etc as leads to slippery slope that derails when someone defends something offensive to one race, religion nationality or orientation. English slang for cigarettes for example. Suffice to say whatever your opinion of the word…horrible PR and marketing. Sure we could agree with that, right? No, I think education is always the key no matter how long it takes. After all it’s only the largest baking company in the world, not a slang word and makes Hispanics feel more inclusive. Unless you think it’s a good idea to dismiss it because being inclusive takes effort? The Union have plenty of other apparel without the Bimbo logo. Just to add,”everything to go right”- we all read that as a Cup. I think the FO reads that as a first round playoff win. Imagine the smugness if they’d knock off a 4th seed on the road. We’d be inundated with stories of how it’s anybody’s game now. Gotta be in it to win it. A chip and a chair. 4th and Forever. Ugh.